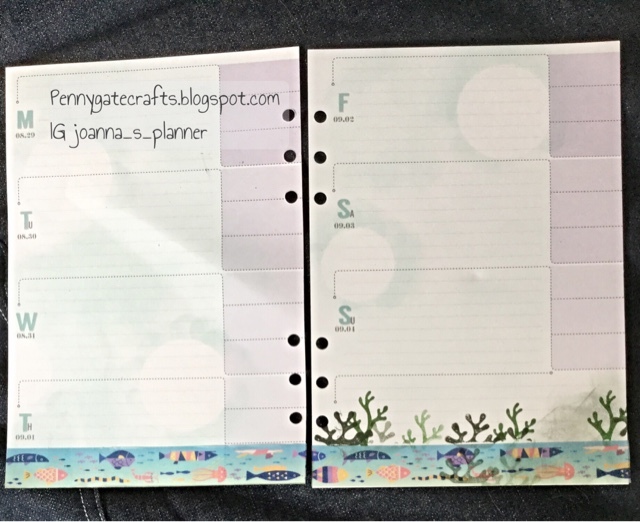 This weeks planner design was inspired yet again by Kristine Bryant on the Planner Stamping/Creative Planner groups. 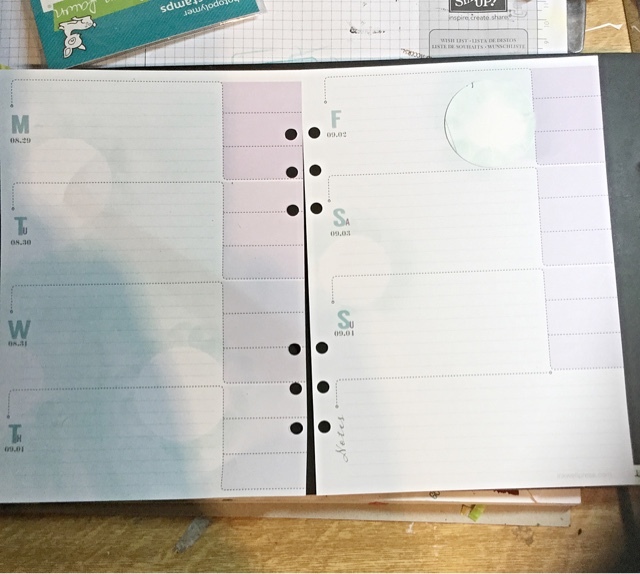 Last week she posted a fabulous BuJo spread with bubbles....I thought bubbles hmmmm! I couldn't write in bubbles as they don't give enough space but I could decorate in bubbles. The natural decoration for bubbles would be mermaids. The bubbles formed little prisons. Now who on earth would imprison mermaids in bubbles? 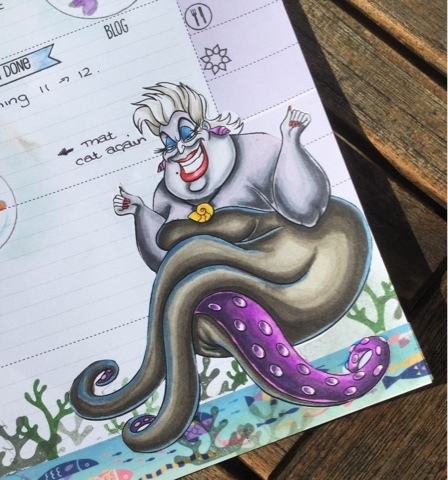 Didn't take me long ......... Ursula the Sea Witch from The Disney film 'The Little Mermaid'. Ursula is definitely my favourite Disney Villain, mostly because she reminds me of my mother who used to be a large, blonde lady with a funky hairstyle but is now a much older, much slimmer, less mad lady. 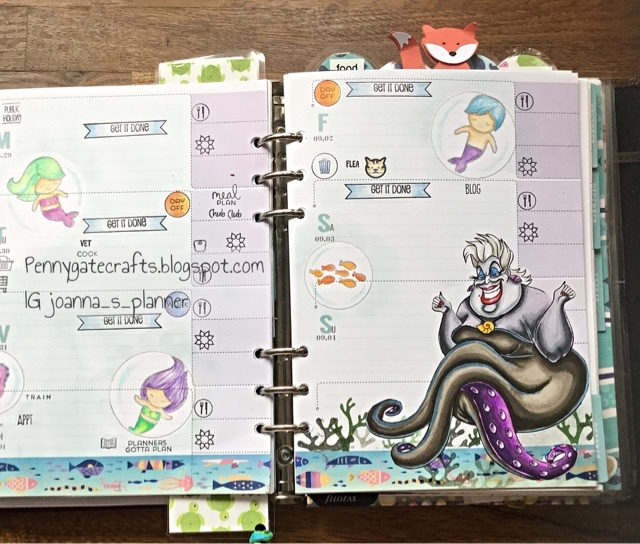 I started with my blank pages and masked off my bubbles before dabbing around the page with a sponge and Stampin' Up soft sky ink. You can see my mask top right. It was punched out of a piece of card. I also used the waste later to outline my bubbles in silver gel pen. 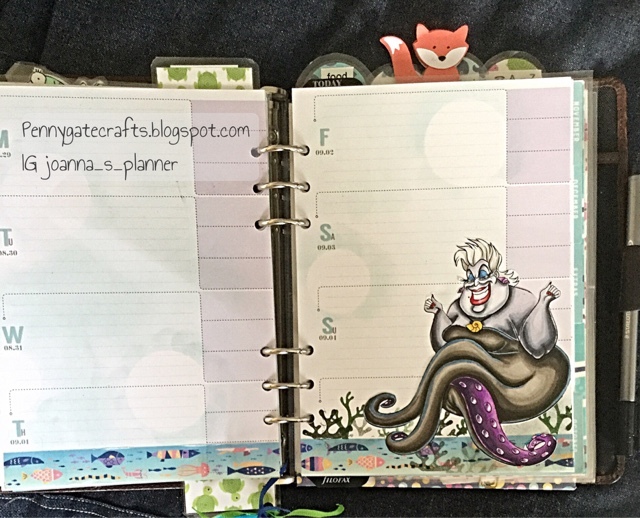 Next came some seaweed from the Lawn Fawn Mermaid set and some lovely Washi from the Washi Fairy Godmother. If you look really closely you will see that I have used the Washi upside down. I only worked this out when I spotted the upside down swimmer. You can also see some of the seaweed stamp that shows through the semi translucent Washi. 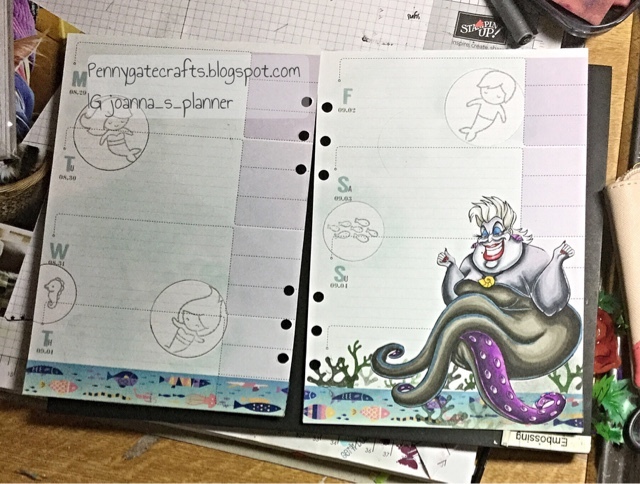 Next came Ursula. She was printed on to sticker paper and was coloured with alcohol markers. I can honestly say she was the most difficult character I have ever coloured as I followed and original Disney image, which doesn't follow all of the classic rules of light and shade. She is mostly coloured with warm grey markers for her tentacles and cool grey for her upper body skin. She was fussy cut and applied direct to the image. 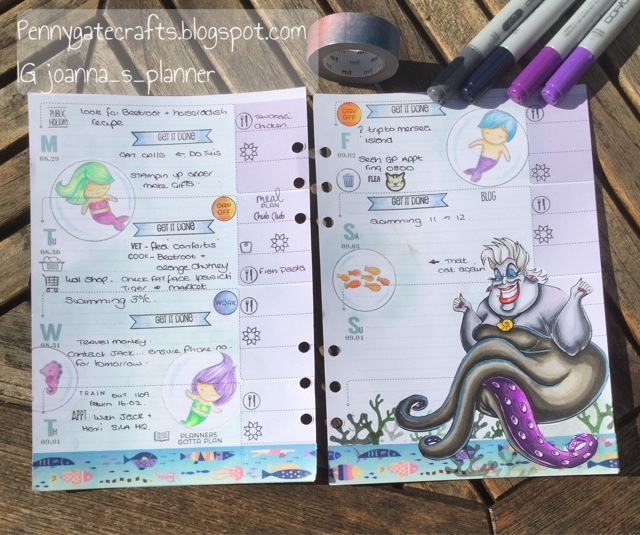 In the next image I have stamped the mermaids and sea creatures into each bubble. I used the negative waste over the masked image to make sure the stamp did not print outside the confines of the bubble, and I used 'London Fog' a grey memento ink, so that the figures had a slightly faded look to them. Ursula had taken their souls. At this point I decided that outlining each bubble in silver gel pen was required just to define the edges of the bubbles. Time for some functional stamps. Mostly from Technique Tuesday, Tiny Stamps Big Plans (who do great custom stamps) with a little Studio L2e for good measure. 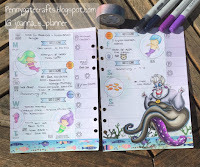 Colour has been added to the mermaids and sea creatures with Faber Castell Polychromos. If you look closely you can see a little extra light blue pencil has been added to each bubble to add shape and dimension. Finally I start to pen in my plans and `To Do's` for the week. 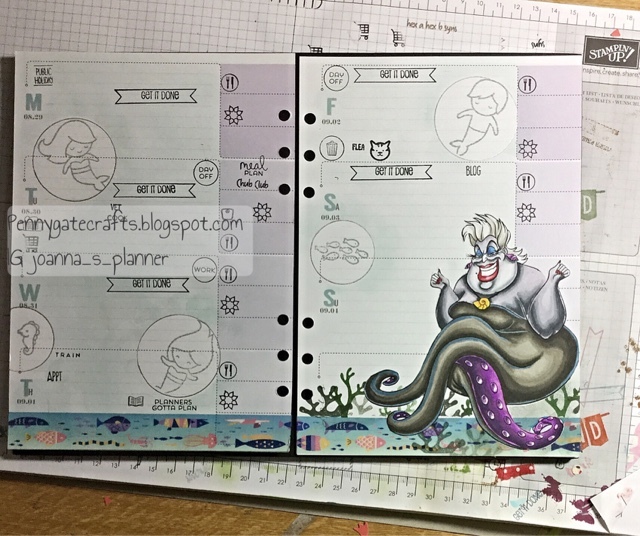 I do tend to cram writing in all over my spread, and will add much more during the week. By Sunday the spread will be full and there might even be a very small amount of #llamalettering. I can see in this picture that a couple of the bubbles would benefit from having quotes written around them, so I will be off to do that next.